Taken straight from our list of The Very Best L Names for Boys and Girls is the lovely name Luna. 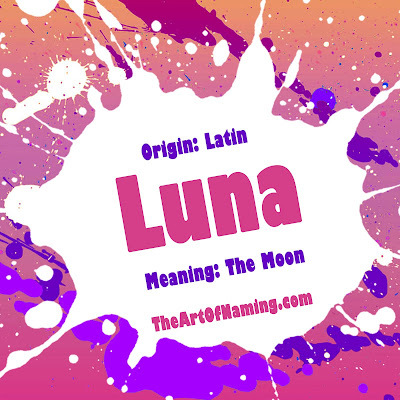 While Luna is usually listed as either Italian, Spanish or both, it originates as a Latin name meaning "the moon". According to the ancient Roman mythology, the goddess Luna was considered the divine embodiment of the moon and was often portrayed as driving a white chariot through the sky. Her Greek counterpart is the goddess Selene. As a baby name in the US, Luna dates back to the start of our modern records in the year 1880. Luna has been used on and off over the years, encountering a bit of a dry spell in the mid-60s. It was never popular until recently when it joined the Top 1000 names in 2003. It has been steadily rising on the popularity chart since then. 2,314 baby girls were given the name in 2014 for a ranking of #143. At this rate, it should continue to rise in popularity. Luna is short and sweet. It carries beautiful imagery with it as it evokes peaceful vibes synonymous with the night sky. It works very well on Spanish and Italian girls but it is popular enough now to work on anyone without raising eyebrows. 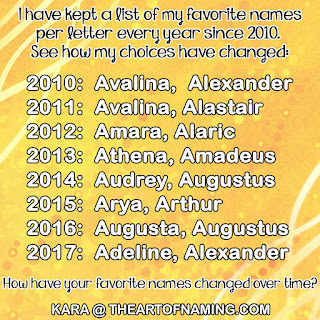 What do you think of the names I suggested? What would you pair with Luna? My favorite guilty pleasure pairing is Luna Sapphire for the image of a big blue moon.